To summarize briefly. The sympathies between the FARC and Chavez/chavismo are now vox populi, from Chavez himself to a cohort of servants proclaiming their love to the FARC (Iris Varela and Rodriguez Chacin among the most explicit of the lot). Direct collaboration was not yet absolutely proved but there was enough evidence to point out to active support since before the days when Rodrigo Granda was quietly living in an Aragua village. When the Reyes computers were seized last year and evidence of close ties came up it was a surprise to no one. Ecuador was also in the brew since for some reason the empty suit of Correa hates Colombia and Uribe more than Chavez does, if possible. But more about that later, suffice to say now that for Venezuela and Ecuador the need to remove Uribe and his ideas from Bogota is a strategic must as Colombian success only amplifies the more the failures of these XXI socialism regimes. Now Colombia has revealed that anti tank weapons sold to the Venezuelan government by Sweden's Bofors more than a decade ago, BEFORE Chavez gained office, have found their way to FARC camps. This is a violation of all sorts of international treaties and agreements that I shall not insult your intelligence in detailing. Before I go further I cam going to tell you how this came to be, and I am willing to bet a lot on my hypothesis. Chavista military and FARC sympathizers are simply stupid and uneducated (no redundancy here). They probably thought that weapons sold to Venezuela more than 10 years ago were forgotten by all and that no one would worry about them if missing. No one in chavismo ever bothers to check out contracts, conditions, rules, supervision, etc, etc... 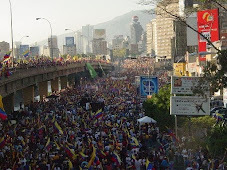 When you live in Venezuela you know that just by looking outside your window at your street look. That is why Venezuela gets into so much legal trouble overseas: neglect and ignorance magnified by arrogance. So, one day, simply some chavista agent had the "great" idea to give those things to the FARC (and probably pocket for himself the money/goodies he was supposed to give them instead). In all fairness it is quite possible that Chavez had no idea of that, probably would not have approved if informed of it, but has to fix the problem anyway. Though Chavez is arrogant enough to have authorized that deal, you know. With the bolibananians all is possible. If it were a normal government what would have happened? The foreign ministry and the defense ministry would have announced an inquiry at home, would have asked for the serial numbers of the weapons seized and within a few days would have done a mea culpa of sorts. Soon, if needed, a fall guy who have been conveniently found, apologies to Colombia and Sweden issued, even an offer of inspection of the remaining weapons, allowing Colombia to know exactly how many were "stolen", and now possibly located in the FARC controlled areas of Colombia. That would have been pretty much it. But in bolibanana things do not work out this simple and logic way. Why? Because the rulers of bolibanana are delinquents and they know that any serious inquiry will be very damaging. Thus instead they accuse Colombia and the rest of the world of slander, say that Sweden has not asked for anything (totally false), suspend relations with Colombia and go as far as announcing that Colombian investments in Venezuela will be reviewed and, well, seized I suppose. Without compensation of course as no amount of money can repair the tarnished honor of the beloved Supremo of bolibanana. Not only they likely made a buck sending the Bofors toys to the FARC but they are going to make an extra buck by blackmailing Colombian interests. Thus tonight the irate and out of all proportion presentation of Chavez on TV, outright lies included. But he needs it, he thinks anyway. As the Honduras feudal possession is flailing badly, and literally through the harm waiving of Zelaya, as protests at home increase daily, Chavez needs to awaken the cheap patriotism so characteristic of proto fascist regimes. Tonight outburst is not directed at me, nor the readers of such blog, it is directed to the uncouth masses (still masses?) that support him still but who everyday wonder more and more how come Chavez sends now weapons to the FARC while crime at home is increasing daily (though according government officials it is only a "perception" of crime we suffer). I mean, one more incongruity added to the litany of previous incongruities of chavismo, eventually it has to add up and Chavez must know that. What does this mean? Apparently nothing really. Chavez knows that Colombia now depends too much on its trade surplus with Venezuela which allows Colombia to compensate for its huge trade deficit elsewhere. So Uribe, pressed inside, will not go much further than these denunciations, hoping for things to quiet down soon enough as Chavez realizes that he cannot replace Colombia's imports that easily, now that he is short of cash to pay for the expensive shipment that would mean bringing stuff from further away than Colombia (and not in Venezuelan taste which are very close to Colombia's tastes; that matters, believe it or not, elemental marketing, since we eat Colombian yogurt, wearing Colombian underwear, taking many a Colombian manufactured pharmaceutical drug, and driving in a Colombian assembled car to purchase all of these things). But this would only be apparent. I have the impression that Colombia has resigned itself to the idea that sooner or later as long as Correa and Chavez remain in office the possibility of a war will increase as the instability inside these two countries will inexorably continue to increase. The more refugees start crossing the Colombian border, the closer to a war we get. I have written already that Uribe has been trying to decrease the trade surplus with Venezuela, through rather infantile measures such as increasing toll fees at the border. Now he will be forced to take more stringent measures. After such a Chavez outburst, coupled to the pitiful show in Honduras to which Correa is associated, Uribe is going to press harder for a close relation with the US, from an FTA to US military bases in Colombia. Public opinion of Colombia is today somewhat in favor of these things and the more Chavez screams, the more he helps the Uribe camp. Colombians are a well educated and courteous people who already before Chavez looked down on silly and vulgar Venezuelans. On the long run what Chavez is creating is a recipe for disaster, for Venezuela, not for Colombia. Right now, if he were foolish enough to create a broader incident, Colombia would win the war in a week or less. A week and a couple of day if Ecuador jumps in. Colombia has a real army, well trained and experienced, and lean officers. Venezuela Army is not an army anymore, just an agency to pillage the oil money profits, by selling weapons to the FARC for example. And managed by potbellied grease sweating generals. PS: I put Ecuador as a foot note though it is involved in this mess. What I simply want to state is the absolute lack of credibility that Correa has, and how he thinks we are all stupid. A few days ago a FARC video was revealed and in it the FARC admitted funding Correa's electoral campaigns. Correa of course denied everything, Chavez style. But Correa went a step further and asked the FARC to validate the video. The FARC assuredly obliged by saying that the video is fake. And voila, Correa thinks he is off the hook. Unbelievable, only Chavez and Correa can pretend that the narcoterrorist FARC is a honest broker! ¡Se cuenta y no se cree!